Brisbane born and bred, John Macdonald lived in London and Barcelona for many years before returning to his native city in 2004. Upon his return he noticed the need for a community gathering space in Brisbane and opened Lightspace in 2009, a boutique event venue and coworking space housed in a warehouse in Fortitude Valley. Now John has launched a second coworking space located just around the corner on Prospect Street aptly named Prospect Studios, offering Brisbane denizens and creative professionals another inspiring space to work. We sat down with John to chat about Prospect Studios and learn more about what ingredients make a thriving creative work space. How did your interest in coworking begin? I was living in Barcelona and some friends had started a shared workspace in a beautiful old shop. It was down a tiny laneway in the heart of the Barrio Gothic and the entrance looked out onto the old Roman walls of the city. It had a fantastic creative atmosphere where everyone could get to work, but a great social aspect as well. What eventually led you to going out on your own and establishing your venue and shared studio, Lightspace in 2009? As a startup or small creative business it can be difficult to find flexible workspace with a high level of facilities. I thought the spaces I’d seen overseas could work really well in Brisbane. The raw warehouse that was eventually transformed into Lightspace had fantastic character and a huge volume of space. It was the perfect blank canvas to create something unique. How the concept for Prospect Studios come to you? We’ve been at more or less 100% occupancy for the past couple of years at Lightspace, so when the opportunity to renovate these two warehouses came up I jumped at the chance. The project took about nine months to complete. Can you tell us a little bit about Prospect Studios? What are your goals for the space? 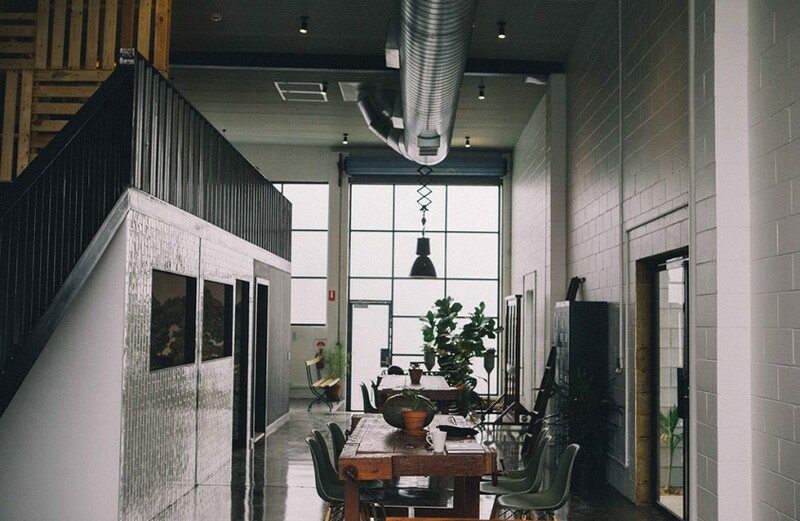 Prospect Studios is a coworking space filled with small creatively based enterprises. We offer permanent spaces and also memberships with flexible access. The goal is to continue to foster a vibrant work community, just as we’ve done at Lightspace, with a fantastic mix of tenants. Can you give us a little insight into the inner workings of Prospect Studios and how the space operates day-to-day? We open up at 9.00am, make sure everyone is happy and the space is looking beautiful. Most work normal business hours but some of the permanent tenants have 24 hour access, so they can be in the studios until all hours if they have a tight deadline. How is the coworking space structured, and how many people can the space accommodate? We offer permanent office spaces on the mezzanine level with 24/7 access. On the ground floor we have a shared memberships space with a work zone, meeting zone, laneway garden and plenty of comfy break-out spaces. At capacity the space could accommodate around 30 people. What are some daily rituals and systems you employ to enhance the effectiveness of the space? Our role is to provide the space for others to get down to work, so we make sure the studios are spotlessly clean, the plants well tendered and the tenants happy. It’s also vital to create the right mix of tenants as everyone has to get along in order for the space to thrive. Your role is to realise other peoples’ dreams by essentially giving individual practitioners, freelancers and small creative teams an incredible space to execute their ideas. Can you tell us how these types of workspaces influence productivity and creativity? Everyone knows walking into one space or another whether or not the atmosphere is conducive to work. At Prospect Studios we’ve tried to create a number of options with anything from individual desks to shared spaces to lounge areas and a beautiful laneway garden. The tenants are sure to find a suitable space whatever their work mood. Can you tell us a little about the building? How would you describe the space you’ve built, and what influenced its style? I was really inspired by a recent trip to Tokyo and some of the design reflects that. As Prospect Studios was hatched from two small freestanding warehouses, a Japanese style really suited the aesthetic I was hoping for. There’s also so many amazing warehouse transformations around the world – flipping through lots of coffee table books on design was a must! Tell us a little about your choice of materials? Perhaps one of the building’s prominent features are the huge steel framed glass windows and doors. These have fantastic character and also allow a huge amount of natural light into the space. We’ve also tried to utilize a mixture of vintage pieces and modern design within the space to create the right balance – not too shiny and modern, but not too retro either. Probably something that involves lots of travel, surfing and margaritas. If anyone’s out there I’ll listen to all offers. Prospect Studios offers a variety of membership options, from set-space permanent leases, to short-term casual memberships. Image: Photograph supplied by Prospect Studios.